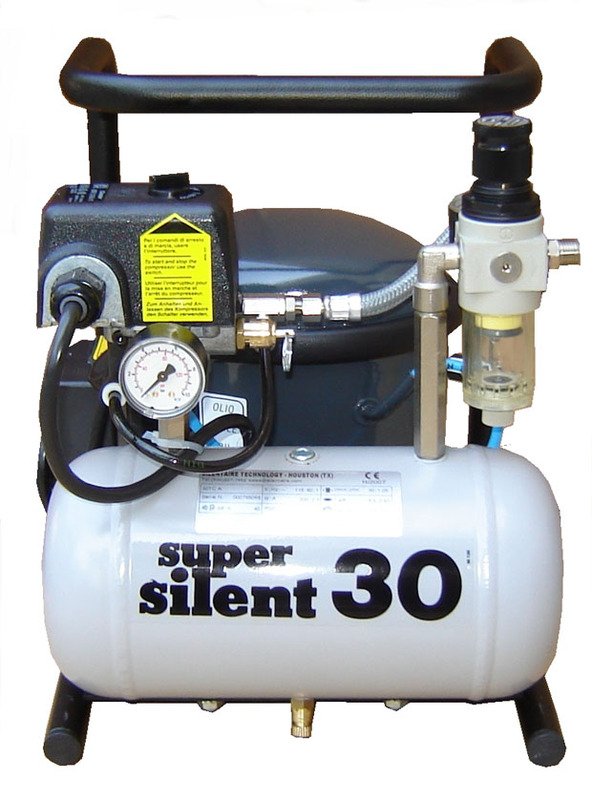 Dimensions: 13.8" x 11" x 13.4"
For almost 50 years Silentaire Technology has been keeping the leadership in manufacturing quiet air compressors. The company has also improved some characteristics of the items and set on the market more powerful and durable devices. Silentaire Technology comprises a variety of compressor models. For example, Val-Air Compressors, Oil Free Compressors, the Spectrum 2000, Sil-Air Compressors, Scorpion Compressors. The Silentaire 30-TC compressor belongs to another Silentaire product line, namely to the Super Silent Compressors line. Silentaire Super Silent Compressors are extremely noiseless as their sound level doesn’t exceed 40 Decibels. Such loudness is similar to raindrop, whisper or quiet library. Then, each device is fully automatic and comes with the on/off switch to shut off the compressor when you don’t spray. All items are equipped with a tank, pressure regulator with moisture trap, a line pressure gauge, a safety valve, an air intake filter, and a carrying handle. More than that, Super Silent compressors are efficient, providing up to 1/2 horsepower. Besides, the pressure output is enough for even and smooth paint coverage. What is also great about these compressors is that they can be used for many hobby applications. At first, the 30-TC model is compelling as its maximum operating pressure goes beyond 100 PSI. Such high-pressure level guarantees consistent airflow for quick coating. Secondly, this Silentaire compressor has the auto operation. The built-in switch turns the motor off in case of a non-operating state of the airbrush. It prevents overheating of the device and extends the service life of the item. Thirdly, the compressor won’t break down because of the excess humidity due to the moisture trap that absorbs the liquid. Although the 30-TC compressor is powerful, it is whisper quiet. It won’t ping, squeak or produce other sounds which can irritate your hearing. For more information, check out the Instructions. * Special note. Before you start assembling the device, carefully read the User Manual and the Manual Instruction. They contain all the necessary information you may need for correct installation and operation. Otherwise, it can lead to the damage of the compressor.